You know that feeling you feel when everything seems to be lining up perfectly for you, everything's going your way, and you keep getting unmistakable signs from the Universe that it's all working out? That's you in the Vortex, my dear, and it's the BEST feeling ever! It's also one of the hardest feelings to hold onto consistently, especially when you feel like what you're doing is no longer working and everything is crap. When you're in the Vortex, everything is easier, your goals seem closer than ever and effortlessly achievable, you are full of gratitude, and you can actually feel the support and love of the Universe. When you're not there, pretty much the opposite of all that is true. Everything is harder, you feel the resistance and distance from the Vortex, and wonder how you're ever gonna feel the good feelings again. I've been there. Heck I still go there from time to time, but with practice I've become pretty good at recognizing the contrast and returning the high-vibes. That's why I made this list. To remind myself that I don't have to stay outside the Vortex, and neither do you! How can you not feel that Universal connection when you're taking a walk in a forest (when I can find one), at the beach, sitting under a tree, or just feeling your toes in the grass or the sun on your face? It's pure magic and guaranteed to get me back in the Vortex FAST. This is number two simply because after being in nature, this is the next best way to get me back to my aligned self again. 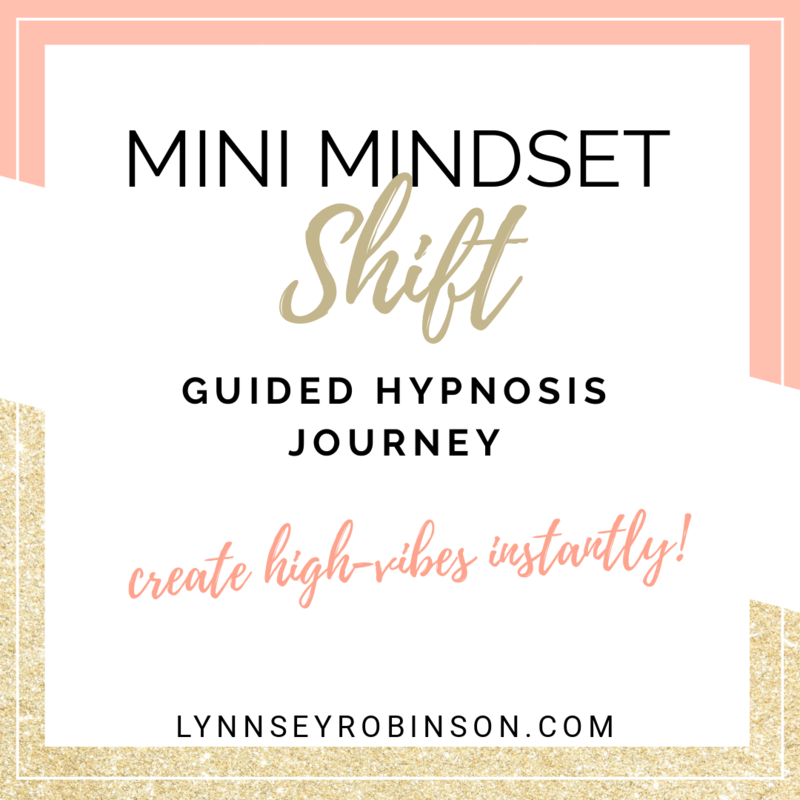 Both very powerful, but as a hypnotherapist I've found in my experience that hypnosis can definitely take you deeper than traditional meditation and therefore create a deeper shift. Sleep is like our built-in reset button. When I find I've fallen out of alignment, I'll give myself positive suggestions/affirmations before bed. I always wake up feeling better when I do this. If I am already in the Vortex, I still do it anyway because it's just a good practice to have! TIP: Your subconscious mind is the most awake and receptive 30 minutes before you fall asleep and 30 minutes after you wake up. What you put into your mind during that time is 10X more powerful than any other time of day. Make those magic 30 minutes count! I'm not a fan of cooking (like, really really not a fan), but I LOVE to bake. It puts me right into "the zone", and when the aroma starts filling the house I can't help but feel warm and fuzzy! There's nothing like clearing and cleansing your space. SO therapeutic and bound to make you feel amazing! This is something I try to do regularly, either as a follow up step to de-cluttering, or simply when I feel like it. It's a great way for me to feel reconnected to my spiritual side. Highly recommended! Taking just 3-5 minutes a day to visualize your ideal outcome can have a powerful impact in your manifesting speed! If you're not sure how to visualize, don't worry. I got you covered. If you remember nothing else from this post, remember this: You must always remain in gratitude. Nothing is ever happening TO you, it is always happening FOR you. One of the best things I ever did was begin a consistent gratitude practice. If you haven't yet, get on it! It will truly change your life and make those days out of the Vortex far less frequent and crappy! Going out of your way to make positive ripples in the pond feels so good and has the ability to immediately shift your energy. Now I'm not gonna lie, my kids drive me absolutely nuts some days (usually when I'm already out of the Vortex), but when they run up to me and give me big hugs and kisses and just want to cuddle mommy, it's literally one of the best feelings in the world. Since I'm currently expecting boy #3 in November, this category also includes feeling my lil guy moving around and kicking. It's hard not to feel miraculous when there's a new soul growing inside of you! PS: If you don't have kids, go hug a pet! It's not totally the same but it'll still feel good. Helping women realize their power and step into their greatness is my life's passion and purpose. Walking the path you were meant to walk and simply following your intuition will always put you in the Vortex. Also referred to as affirmations, the simple idea is to decide what you want to attract, feel it in completion as much as you can, and write it down! Your handwriting is a direct line to your subconscious, so whatever you're writing as an intention is basically a hypnotic suggestion to yourself. Use this to your advantage to reprogram your energy! Piggybacking off the last one, journaling is another therapeutic and cleansing practice that can have powerful positive effects on your energy and outlook. Sometimes I just need to get it out of my head and onto the paper to make sense of things, see from a different perspective, or resolve an issue that's affecting me. You can type it out on a computer or phone, but again, the most positive shift will occur when it's in your handwriting. So go write it down and see how great it feels! PINTEREST!! It's like a virtual vision board! I love browsing Pinterest dreaming, getting inspired, and getting new ideas and intentions for myself. But beware, it's so easy to spend hours there and lose productivity, which will make you feel terrible, and that's the exact opposite effect of what you're trying to achieve! So go set a timer and get inspired! If you're not using essential oils, you're seriously missing out. Smells and aromas are super powerful mood lifters. The best one's I've found to lift my energy are anything citrus like orange or lemon, and I also love peppermint. Play around with what works best for you, but try and make sure they're natural, pure essential oils from plants. None of that fake chemical junk! Whether I'm opening the communication through mental thought or verbal words, my guides are always, always listening and trying to communicate with me. Sometimes I may fail to interpret when or how they are trying to get their message across, but they're always there. Open a dialogue, say what's on your mind or heart, and you'll begin to feel that support and love of the unseen. I promise! You can also make an agreement with them as to how they can communicate with you so you KNOW it's them (see mine at #22). There's no higher authority on getting into the Vortex in my book. Chances are if you know what the Vortex is, you heard it first from Abraham Hicks. When I need a loving kick-in-the-pants reminder of my universal connection and power, this is my go to a lot of the time. If you're new to this idea, here's a great beginner video for you. Nothing better than a perfectly made cup of coffee! Enough said. Sketching, coloring, writing, singing, whatever gets your creative juices flowing! Your creativity is your spirit playing, and it's a super fun way to get back into the mindset for manifestation! This one's the hardest one for me to get into, but it's never failed me! When I exercise, do yoga, or let loose and dance for a few minutes, I always feel crazy amazing after! It's an immediate mood lifter, and even if I don't feel like it, I try to do it anyway knowing how much I'll thank myself for it! This is super easy when you have kids. Take them to the park and swing or slide with them, play restaurant, blocks... whatever it is that will let your inner child out! If you don't have kids, you can still do all of these things with a pet, or something else that allows you to be carefree for a while! Remember the agreement with the Universe to show you a certain sign or symbol of their communication? for me, it's a hummingbird. Every time I see one of those lil' guys I get so happy and at peace, because I know the Universe is telling me everything is working out for me, in case I forgot. Which one's your favorite? Do you have a go-to move to get back into the Vortex not listed here? I'd love to hear about it in the comments! GET MORE AWESOME STUFF LIKE THIS RIGHT TO YOUR INBOX WHEN YOU JOIN MY COMMUNITY, PLUS GET MY MOST POPULAR GUIDED HYPNOSIS AUDIO AS A FREE GIFT FOR SIGNING UP!